Decorative platters, which tempt hungry guests with fresh fruits, make an excellent addition to the party table. This healthy and refreshing snack attracts both adults and children, who enjoy tasting colorful morsels. While an attractive platter is easy to arrange, some hosts are unsure, how to prepare one for a family get together, or a party. In this article, you will discover, how to select and prepare fruits, place juicy elements in a visually pleasing way, store and serve a completed plate. Impress your family and friends with stylish and yummy fresh fruit platters during the next family get together or party! A bulk of ingredients should come from local sources, as such fruits are most fresh and healthy. The person, who is responsible for collecting party supplies, should check out a local bazaar and farmer's market for ripe, seasonal produce. A visit in a supermarket will yield those more exotic, but attractive and colorful products. There are infinite ways to compose this dish. 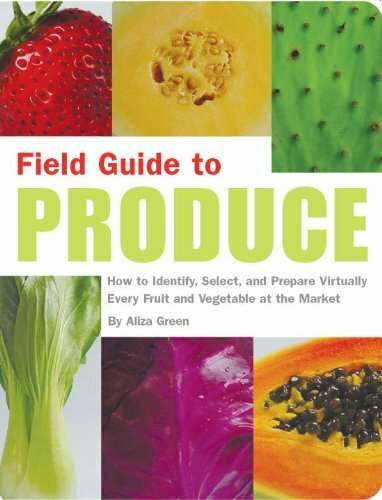 Therefore, instead of aiming for specific produce, try to check available stuff and buy any cheap and fresh fruits. Aim for the best looking and most colorful ones with consistent pigmentation and no blemishes. When it comes to those exotic snacks, a few types of fruit are particularly suitable for creative party platter arrangements, due to their decorative shapes and unique qualities. A pineapple acts as an eye-catching centerpiece on a large tray. Its pieces enhance the visual design, as they form patterns on a serving tray. Besides, guests expect to see a pineapple in this type of arrangement. It's decorative enough to justify an acquisition of a can with pineapple slices. A kiwi fruit improves an arrangement, thanks to its intense green color, a contrasting motive of tiny, black seeds and a unique, tart taste. One can't go wrong with a strategic placement of a few slices of a Chinese gooseberry on a serving platter. A peach indulges party guests, thanks to its juicy and sweet contents. Pieces of peach on a fruit platter should be small enough for consumption in a one mouthful, so as to avoid staining eaters with its sticky juices. Strawberries create an impression of luxury and refinement, flawlessly matching champagne or white wine, which is present on a party table. Place a few strawberries in a geometric pattern to take advantage of their elegant shape and vivid, red color. A watermelon refreshes visitors, thanks to its high water content. This fruit is an essential ingredient on the table during any summer family get togethers and parties, which are hosted outdoors. After cleaning your hands, wash purchased fruits thoroughly under a stream of running water, while gently brushing them, to rinse off any sand and remove germs, pesticides and other chemicals. Never use strong chemicals, which are designed for other cleaning purposes, as those can be toxic. Folks, who want to specifically disinfect the produce, can soak them in a warm water mixed with a tablespoon of an apple cider vinegar for 15 minutes, before giving them a proper wash. Occasionally, producers cover their crops with special wax, to keep them edible for a long time. While this covering is harmless, bacterial agents, dirt and chemicals often get stuck to it. Therefore, most consumers prefer to remove the wax, unless they intend to peel covered fruits. To remove the protective layer, try a vinegar bath described above, or scrub items, after applying a bit of baking soda. It's best to peel and cut fruits shortly before serving them, so that exposed surfaces don't oxidate, losing their nutritional value and changing color for worse in the process. However, busy hosts often need to prepare some dishes in advance, instead of leaving all preparation for the last moment. In such circumstances, cook can use a few tricks to keep the slices fresh. Apply lemon juice to exposed surfaces of fruit pieces. A citric acid, which is present in drops of juice, inhibits an oxidation, therefore keeping these slices fresh. Place sensitive food parts in a bowl of cold water, which covers them completely, because nutrients can't oxidize underwater, due to the lack of an air. However, avoid using this trick on juicy fruit, to protect them from "bleeding out". 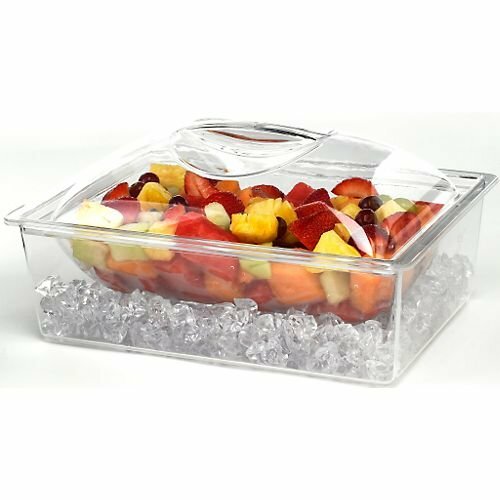 Cover a finished fruit platter, or an assortment of chunks and slices, with a sheet of plastic foil, which sticks closely to the food and its tray. Make sure to attach it well, to isolate the dish from a fresh air. Whether you apply any more tricks or not, keep in mind, that both ingredients and prepared platters must be stored in a fridge, until it's time to serve them on a party table. This keeps them fresh and protects sweet morsels from insects. Besides, cool fruits taste better and seem more refreshing. Any host would like to make creative fruit party platters, which would delight and satisfy their guests. Depending on the choice of fruits, and the time available for playing with the composition, one can try different types of creative arrangements. Let's have a look at few different fruit platter ideas, and find out, how to prepare them. Credit: Panfilo Nuvolone (1581-1651), oil on panel; via Wikimeda CommonsA whole fruit platter seems easiest to prepare, as the cook avoids all the slicing, preparation and storage issues. However, this design requires an artistic skill, as its success depends on a clever use of color, space and shape of composition elements. Art admirers may find inspiration in classic still-life paintings, going as far, as attempting to imitate the specific creative depiction with live fruits! This type of fruit platter arrangement turns out best with a strong centerpiece, such as a pineapple, or a vertical element of the tray, surrounded by various berries and fruits, placed around in non-symmetrical fashion. Large fruits with clusters of currants and grapes fit this still-life design, adding the sense of movement. A few leaves or flowers, placed strategically in the composition, complete an artistic delicacy. Credit: beglib, via morguefile.com free archiveA divided fruit platter arrangement consists of colorful slices and chunks of assorted produce. This type of design looks best with elements, which encircle a small centerpiece in concentric rings of a single type of material and shape. Here, a symmetrical placement of items improves the result. Credit: Carin Araujo, via sxc.huA chunk mix fruit platter contains small pieces, cut haphazardly and mingled together. This type of a decorative party plate requires no design skills. It's easy to guess, that it was inspired by a common salad. However, there's a one major difference between our platter and a bowl of salad: the chunk mix is missing any sauce. To achieve the best effect with this fruit tray idea, offer it with a few bowls of sauce, which are served separately. Any syrup, yoghurt, liquid chocolate, or vanilla sauce compliment a fruit platter well. Each guest can fill his empty bowl with a portion of the mix and add his favourite sauce, or combine a few fillers together. This arrangement is perfect for a smorgasbord party. A host may bring out elaborate fruit platters from the kitchen just before the consumption. However, when served on crushed ice and covered with a transparent dome or plastic foil, fruits can decorate tables for hours, as they stay cool and tasty. Try this during a summer party, when guests especially love chilly, juicy snacks. 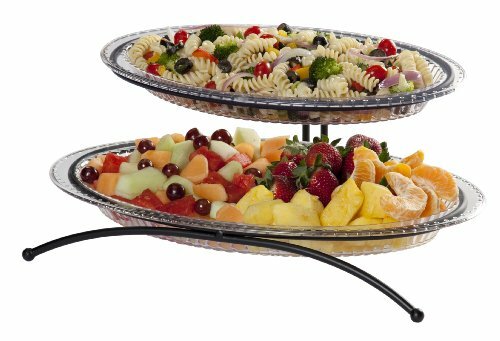 For a large gathering, use multi-level serving trays, as they are more convenient to handle, than multiple single platters filled with fruits.